Together with the A Tale Of Earth And Sea expansion, we are releasing a seven-chapter novella, portraying the exciting origins of the Shaman and the early dark history of Ardent. Read it here! It was called The Grange, and it was a foul place. It seemed to Riona that even the sun, which elsewhere shone with such loving warmth and radiance, felt only disgust for those dwelling within the rotting fortress, and, so, chose to shun them, too. But as she stared up at the unending grey sky, the young girl suddenly changed her mind. It was not disdain, Riona decided, which kept the sun aloof from them, but rather shame. For why illuminate so wretched a place? To better see the agony on the faces of the tortured prisoners, young and old, whose bodies and spirits had long since been broken? To finely observe the mud and filth, in which, like a horde of verminous rats, they were all forced to live? Or perhaps to better glimpse the satisfied delight in the eyes of their jailers, fanatical zealots, the lot of them, who relished condemning so many poor souls to death every day? No, thought Riona as she glanced up again at the bleak sky, there was nothing for the sun to be proud of here. Riona and her sister, Penn, had been prisoners in The Grange for almost three years, since they were but children of ten. Today was their thirteenth birthday. As she pondered this, Riona’s thoughts were interrupted by the anguished moaning of the old woman nearby. She had been brought in the night before with the new group, though few of that group now remained. Their screams had lasted until dawn. Even after three years, the nightmarish sounds, though so routine and constant, were not ones Riona had ever grown used to. In fact, in recent months, they peculiarly seemed to affect her all the more acutely. The sound of any individual in pain now reverberated inside of Riona with such unbearable intensity that she often wanted to cry out herself. It was always immediately followed by another sensation, also new to Riona, and which confused her with the sweeping magnitude of its force and strangeness. It was as if she were suddenly engulfed by a colossal ocean wave. She could almost taste the crush of the salty water coursing through her body, strengthening her, emboldening her, until it filled Riona’s entire being with a pounding, rushing, need to act. Riona cautiously stood up. Scanning the countless shivering bodies and gaunt expressions of the many desolate human beings strewn around the filthy enclosure, her eyes sought the one face which was identical to her own, that of her twin sister, Penn. Riona knew Penn would disapprove of what she was about to do. It wasn’t that her sister would object to helping the old woman, far from it, it was the recklessness of doing such a thing in broad daylight that Penn would be opposed to. For it could easily draw the attention of any one of their sadistic jailers. There were few prisoners in The Grange who had survived for as long as Riona and Penn. In the early days, it had been easier for them to escape notice. What were two small children among hundreds of men and women, adults, who, their spirits having not yet been crippled, vehemently protested their innocence and fought back at the wrongness of it all? There had been much spectacle and pageantry back then, too. For the jailers would let the mobs from all the nearby towns into The Grange. They enjoyed having such a wildly zealous audience. Wincing at the grotesque memories in her head, the jeering, the bloodlust, the hatred of those mobs for them, Riona tried to remind herself that it was now caution and diligence which kept her and her sister alive. So why then, she wondered, did today feel different? Riona spotted her sister, far across the enclosure. Though they were identical twins, both having the same wavy auburn hair and hazel eyes, and faces which mirrored each other, their builds differed, albeit slightly. There was a litheness to Riona, a fluidity, whereas Penn’s frame was huskier and more solid. Penn was crouched down, busily doing something in the dirt, Riona couldn’t quite make out what, but the sight of her sister’s sturdy shoulders and robust activity amidst such a decrepit wasteland, as always, heartened Riona. The old woman moaned again. Riona softly made her way towards her. 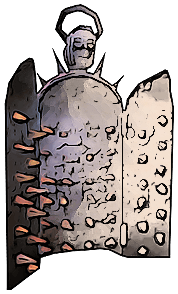 As Penn’s hands combed through the dirt, she watched as one of the jailers loudly cursed the mud, which had just besmirched his glistening new armor. Such were the hardships of his life, Penn bitterly mused. But then, as had been oddly happening to her more frequently in recent months, as her fingers dipped into the ground, she felt the vast richness of the earth moving inside of her, a power, a potency, one she could not name. Penn briefly stopped digging for the object she’d buried so long ago, and removed her hands from the earth. She thought perhaps the forceful rumbling inside of her, like that of boulders crashing down a mountain, would subside if she did. But it did not. Penn resumed her digging, and tried to concentrate. She needed to remember, but it was so hard to latch onto memories of their life before The Grange. And when she did, the gruesome sights and sounds which played across her mind, those of gentle people being slaughtered, of endlessly hiding in dark caves or putrid caverns, of always being on the move, always cold and hungry and terrified of what each new day would bring, seemed not so different from their life now. Penn tried to force her mind back even further. She knew they had been born in a distant region, one which had been laid to waste by The Defiler, and they had traveled to this land when they were very small. For their mother had heard stories about a golden place, built by the hands of many, where warmth and laughter, friendship and light, had gloriously arisen in the aftermath of a world which had been dark for so long. People of all different races lived and worked together as one in this place, she had explained to them, and that they needed to be a part of that. They were going to Ardent, their mother had smilingly told them, to help with the forging of a new and better world. How wrong she had been about it all. The rumbling inside of Penn now furiously grew. They had only but just arrived in Ardent when it began, the whispers and stares, the suspicion of their foreign garb and language, and of their gentle mother’s strange magics. Mallok witch! Mallok worshippers! It had spread quickly, like wildfire, those false words which had been hissed at them, and which had shocked Penn and Riona for Mallok was the name of The Defiler who had obliterated their home and murdered their people. But truth did not matter in Ardent. They had fled to the forest soon after, where they had come upon others like themselves, frightened people, who, having been wrongly branded for being something they were not, were hiding in fear of Ardent’s hysterical wrath at their imagined crimes. Penn and Riona, so small at the time, could make little sense of what was happening to them, and did not understand why they were being hunted down like animals in a place where kindness and friendship were said to pervade. Because a disease has infected this land, their mother had whispered to them, and it was not the type of disease which any magics could cure. A mob of warriors, hunters, wizards and priests killed her two nights later. Penn’s hands dug faster. Why she felt compelled to unearth the object she’d buried so long ago, Penn couldn’t say, nor even knew what its import was. Their mother had frantically handed it to them, just moments before the mob had arrived. Run! Had she said other words to them in those final seconds? Penn couldn’t remember, such was the terror of that night. But throughout the wretched months and years which had followed, of hiding and running and being hunted like prey, she and Riona had always managed to keep their mother’s pouch safe. And when at last they’d been captured by the Protectors of the Realm and flung into The Grange along with so many others, Penn had buried it deep in the ground. Penn’s fingers brushed against something soft, and she knew she’d found it. She pulled their mother’s small pouch from the dirt. The fabric, in hues of beautiful honeyed ambers and rich blues, was strangely unblemished even after so many years in the ground, as if the earth had kept it safe for them. Penn slowly rose. That feeling inside of her, of quaking and rumbling, had yet to subside and she felt ever more charged with a magnetic potency, which sharpened her senses. An instinct told her to turn. She did, and saw an old woman far across the enclosure lying on the ground. Riona knelt over her, but seemed to sense Penn’s gaze, for she looked up. 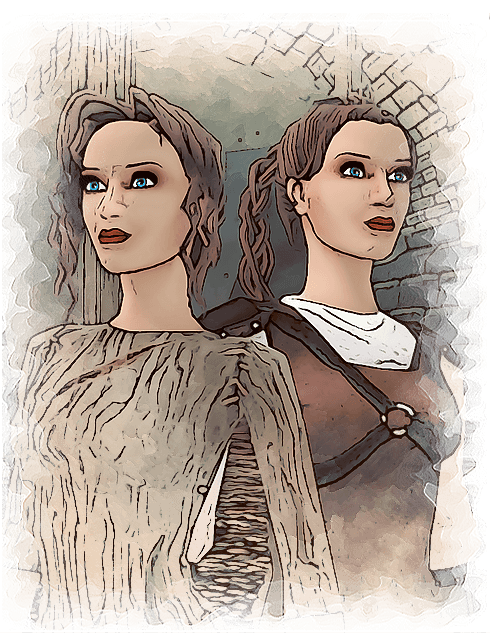 The two sisters locked eyes, and in the same intuitive way that Penn had known to dig up their mother’s pouch on this day, she knew, too, that she needed to join Riona with what she was doing. Penn strangely felt no fear of the jailers as she walked purposefully towards her sister, whose eyes still held hers, locked in a mutual understanding. For Penn was filled with the unmistakable certainty that something was about to change forever, and she knew that Riona felt it, too. The old woman was dying. 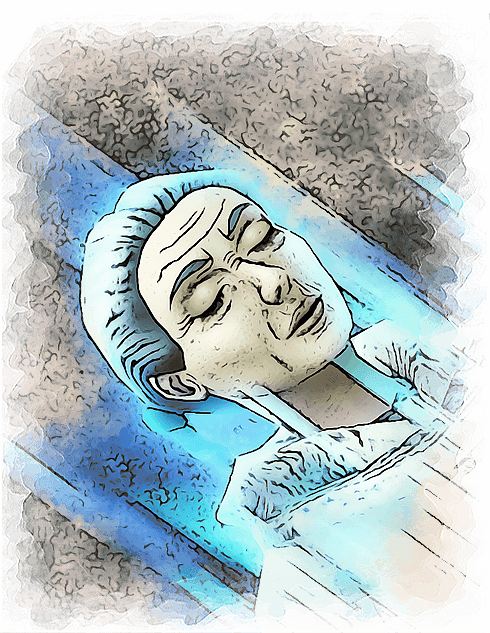 Riona could hear it by the sudden change in her breathing, the clattering gasps of air which now shook her thin frame, an aged body which bore too many signs of a jailer’s wrath. Riona’s hands trembled, but not from distress. From anticipation. In a moment, her sister would be next to her, and Riona, with a surety that she’d never felt before, knew it was going to work this time. She and Penn had tried so often, and so fervently, during their early years in The Grange, always secretly at night, and always so clumsily, for they had just been children trying to mimic something they’d once seen a parent do. Playacting at being their mother. But their efforts had soon grown to feel silly and futile, like trying to set fire to a water soaked log. And where once the childish game had fueled their imaginations, injecting hope and color into their bleak world, it had eventually served only to make everything around them feel all the more leaden and grey, until they had finally just abandoned it altogether. Till now, Riona thought. The old woman’s breathing worsened, when Riona felt her sister’s sturdy hand upon her shoulder. Penn noiselessly crouched down next to her. Vibrant color seemed to ripple around her twin, and Riona saw that it was their mother’s long ago fabric pouch which Penn now wore. It dangled from an amber string around her neck. Riona did not marvel at the strangeness of why on this day her sister had chosen to unearth it, nor why its splendid colors, warm and invigorating, had not faded after so many years in the ground, for it all felt as it should be to her. With a sense of everything having just slipped into place, Riona gently cupped the old woman’s bruised and gnarled face in her hands. Penn’s fingers lightly swept the matted hair away from her eyes, which, at first, stared up at the sisters in panic, but then softened, quite at ease. Slowly, their hands traveled around the old woman’s ravaged body, across the gashes and welts, the misshapen angles of broken bones, and over her heart, the faint beat of which they could feel steadily strengthening beneath their touch. For Riona, it was as if the cresting wave inside of her had at last broken, and its water, smooth and controlled, now flowed assuredly through her, content in its course and purpose. She imagined the cleansing water washing over the old woman’s body, gently scrubbing away the many wounds and hurts, and ridding her of all the pain. Whether seconds or minutes had passed, Riona didn’t know, but when she looked at Penn, she saw that her sister had felt the sense of completion, too. They withdrew their hands from the old woman, and gazed at one another. Riona could hear Penn’s unspoken thought, for it mirrored her own. We did it. And they had. Just as they had seen their mother do all those years ago, Riona and Penn had healed the wounds of another. The old woman began to weep at sight of her now mended body. Riona felt a childish urge to ecstatically shriek and fling her arms around her sister in triumphant joy at their accomplishment, and perhaps even would have, had it not been for the suddenly ominous expression on Penn’s face. Riona saw why. Their accomplishment had not gone unseen. Murmurs and voices, rustling and movement, now rippled around the vast enclosure. The Grange, usually so still and silent with misery, had awoken. Haggard bodies and gaunt faces began to appear all around them. Gesturing at the old woman and pointing at Riona and Penn, the prisoners, their sunken eyes ablaze with burning curiosity, loudly encircled them. For a flickering moment, Riona was reminded of the mobs from the past. But she knew this was not that. There was no hatred or malice surrounding them now, no fearful hysteria or violent bloodlust. There was, Riona saw, only fascination and longing. The starved men and women who surged towards them, had just seen something which did not exist in The Grange, and, so, it drew them, for they had forgotten what kindness looked and tasted like, and they hungered for it. They’ve doomed us, thought Penn, as the prisoners swarmed around them. They were oblivious to the clanging bell which now sounded its alarm throughout The Grange, deaf to the clattering of weapons being drawn, and heedless of the furious jailers who now charged at them. There was a sudden explosion of color, as the jailers, brightly adorned in the reds and golds of the Ardent king, launched themselves at the bedraggled crowd surrounding Penn and her sister. The chaos was immediate, the screaming and flailing of terrified people being struck down and beaten, bodies falling to the ground only to be trampled on in the frenzied stampede of other prisoners desperately trying to flee the swinging clubs and swords of the jailers. Penn’s only thought was for her sister, for she’d lost sight of Riona in the swirling madness. Penn felt dizzy, but not from the crush of the motion, or the deafening wails, but rather from the rumbling force inside of her, which only moments ago had been released upon the old woman. It had poured out of her then, that powerful sense of replenishing the old woman with the richness of the earth. And now the rumbling force thundered once more inside of Penn. She caught sight of her sister. Riona was frantically scrambling to free herself from the clutches of a sneering jailer. Penn rushed towards her, but, in her haste, tripped over a lifeless body on the ground. It was the old woman, whose head now bore a fatal new wound from a jailer. The rumbling within Penn grew in magnitude; something vast and thunderous was forming inside of her. When she looked up, Penn saw the jailer strike her sister with a club, and watched as Riona crumpled to the ground. And with that, it broke. Whatever thin casing or fragile shell it was holding the vast force inside of Penn together, now cracked apart. She could hear the sound of the fissure, for it drowned out all other noise. And Penn realized it was not imagined. The thunderous sound, that of a great cracking and splitting taking place, of something being violently ripped open, was the ground. It quaked and trembled, and broke apart. And now it was the jailers who screamed as the muddied earth beneath their feet collapsed, and great chunks of the stone walls surrounding them, splintered and came tumbling down. The earth was devouring The Grange. Penn understood that it was her, that she was doing this, but comprehended little more, for everything was a frenetic blur, as if she were inside of something else. She couldn’t see or hear, and felt as if she were madly spinning and thrashing in a sea of color and motion which violently churned all around her, going faster, and faster, till she could hold on no more. Penn saw blackness, and collapsed on the ground. The mighty quaking of the earth ceased. Pushing aside the rocks and debris which covered her, Riona spat dirt from her mouth and struggled to her feet. She blinked in wonder at the sight around her. The Grange was in ruins. The great stone fortress, so tall and impregnable, and which had held them captive for so long, now lay in rubble. There was an eerie silence, for many were dead, or, like her, slowly stirring and feebly pulling themselves from the wreckage. But one sound now suddenly rang out, and it was vicious. A roar, a bellow. It came from a single jailer, who, sword in hand, issued forth a furious war cry and began to run, to charge at something Riona could not see. But with his next words, which he shrieked in rage and which conjured up the familiar terror of old in Riona, she knew, even without seeing, what drove him. Mallok witch! He howled it again, and charged at her sister. Riona screamed for Penn, on the ground, to rise, to see, to move, but Penn, looking so drained and worn, seemed in a daze on her knees, as if she were just groggily waking from a deep slumber. Riona screamed again, and felt herself running, but knew she could not reach her sister before the jailer, who thundered furiously across the ravaged landscape with a single murderous goal. Her sister looked up, just as he reached her. It all happened so quickly. The pounding wave inside of Riona swelled once more. She felt its savage current moving through her, and needed the water, not to gently cleanse or heal another, but to destroy. And it did. Water burst forth from the broken earth. A river, a storm? Riona didn’t know, just felt, though she stood motionless, as if she were clinging helplessly to a great untamed beast as it surged forward. It was both violent and beautiful as the powerful flood of water shot upwards, danced for a moment in the air, and then crashed back down in a torrent of battering rain and gusting wind. The jailer was swept away in its onslaught, Riona saw that much before her vision blurred and she sank weakly to the ground. The sudden gale left as quickly as it had appeared. Riona felt Penn’s hand pulling her up, and she gripped it tightly back. The two sisters, standing hand in hand, took in the enormity of what they had done. 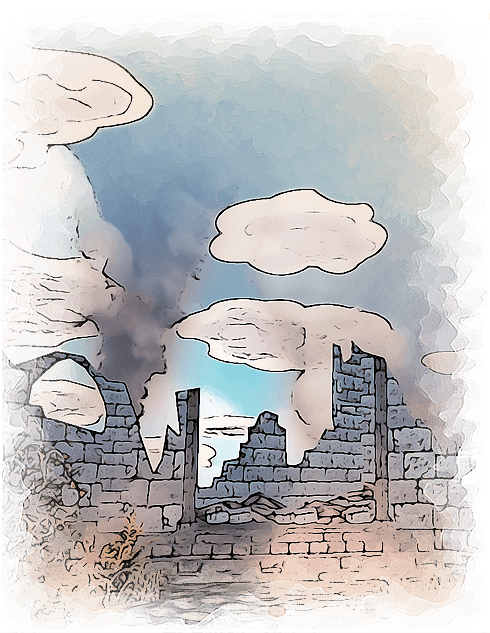 The terrain, gouged and broken, with muddied water pouring out of its many deep gashes, was now surrounded by open sky, and it was this they next gazed at. A view without walls. 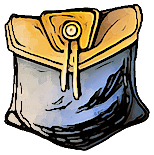 Penn removed their mother’s fabric pouch from around her neck, desperately hoping, like Riona, that its contents might at last help them to understand who and what they were. The sun warmed their faces as they walked towards the open sky ahead. It seemed to Riona that it was shining down on them now, like a proud parent. Riona smiled. So did Penn, who thought to herself: I’m going to raze Ardent to the ground. It had been almost a year, and they still hadn’t found it. But Riona knew they would. Just as her hands now grabbed each slippery rock above her without fear of losing her grip and her feet never faltered as she climbed up the treacherous sea cliff, so, too, was Riona’s unwavering certainty that she and her sister would eventually find whatever it was their mother had left for them. Riona pulled herself up onto the jagged ledge where Penn sat, and contemplated her. She knew doubt had crept into her sister’s mind, as to if they would ever find it. And frustration. 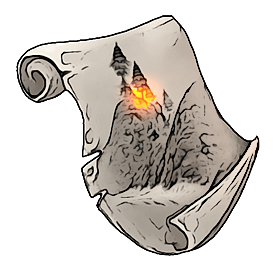 Whereas usually Penn would carefully fold the scrap of white cloth with something like reverence, lately she’d taken to just crumpling their mother’s map into a wad and stuffing it back into the fabric pouch where it had lived for so long with a heavy sigh, as Riona watched her do now. Riona idly plucked it from Penn’s hands, and wondered how many times in the past year they had studied the map. Hundreds? Thousands? It was more of a picture, really, than a map, and had been hastily drawn upon a piece of ripped cloth. It depicted a cliff along the ocean, tall and jagged, and seemingly unremarkable, but for a single spot of color on it, a drop of amber, which had been carefully placed by their mother near its top. Between the two of them, Riona and Penn had struggled to remember the night their mother had drawn it, and where they had been. But they saw only an ocean shore in their minds. Water. Sand. A campfire. Other people? Yes, thought Riona, recalling the murmurs of hushed voices as she’d fallen asleep that night. It was before they had been falsely marked as villains, but only just. The voices had whispered about a madness in the land, but their words had seemed simply like fanciful tales to tell one another around a campfire at night. She and Penn had slept soundly. But their mother had not, for when they had awoken, she was gone. 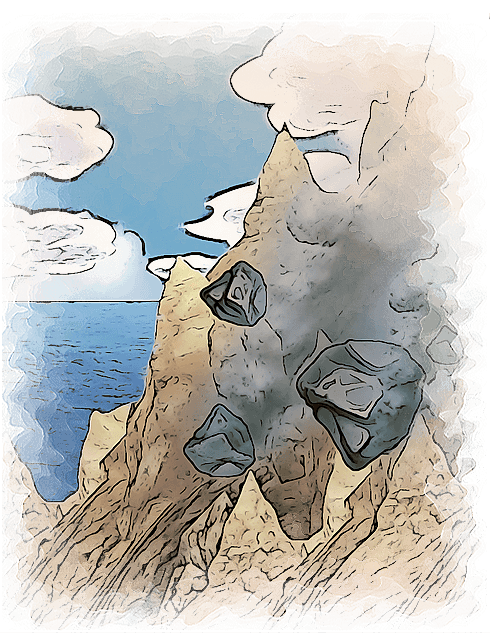 They had soon spotted her, though, her brightly colored cloak being easily visible along the face of the jagged cliff surrounding the shoreline, which she was climbing down from. When she reached Riona and Penn, weary and saddened it had seemed to them, she’d said only that a restlessness had come upon her during the night, and that she’d needed to expel it. But then, seeing their worry, their mother had smiled and drawn them in close. Pointing at the cliff, she had told them that up near the top of it, she’d tucked something away for them for safekeeping, and that later on, they would all return together for it. She’d drawn the picture on the scrap of cloth just after, then tucked it into the pouch around her neck, and had said no more about it. Riona gazed out at the vast ocean, which was presently calm, and let its soothing power lull away the sadness which had just crept up on her. It was peaceful being up so high, she thought. And, as she’d done almost every day for the past year since they had left The Grange, Riona marveled at the beauty of freedom. They weren’t free, thought Penn, as she nudged her drowsing sister to resume their climb, and wondered if they ever would be. For with their destruction of The Grange, all of the warriors and hunters, wizards and priests of Ardent, or, as King Herron liked to call them, his noble Protectors of the Realm, now savagely scoured the land in pursuit of the demonic twin witches who had brought a fortress to the ground. Penn and Riona were being hunted once more, and with an even greater fury. For tales of their ghastliness churned throughout the land, of their gnarled faces and fiery red eyes, of the newborn babes they sacrificed in vile rituals, and of how, as devoted servants of Mallok, they sought to unleash the horrors of the Shadow Years once more and drown the world in darkness as their master had done before them. But even worse for Penn was the sickening knowledge that everyone was imagined to be in league with them. Contagion, as always, thrived in Ardent, and it was rampant now, for anyone deemed suspicious by the Protectors of the Realm were promptly branded as being conspirators with the twin witches in their efforts to bring darkness to the world, and were condemned. How many other death camps like The Grange were currently being filled with even more innocents as a result of the increased hysteria and the savagery of King Herron’s fanatical thugs, Penn wondered, and was incensed by the thought. A cascade of dirt and debris suddenly exploded down upon her. The sturdy rock Penn had been grasping as she climbed upwards abruptly loosened and began to give way, her feet, too, had lost their purchase as the whole of the mountainous sea cliff now ominously groaned and trembled. Penn realized that she was causing it, and it terrified her, not the fear of falling, but that she was helpless to the enormity of the force inside of her which so easily leapt out in tandem with the rawness of her emotions, as it had just now. With a calmness and serenity that never ceased to amaze Penn, her sister, now also dangling precariously herself from the shuddering cliff, spoke Penn’s name. The gentle sound of Riona’s voice, like so many times before in the past year whenever this had happened to Penn, now acted as a tonic. It was as if a soothing liquid had just been poured over the violence raging within her. The cliff, mollified, steadied itself and grew solid once more. Penn heaved herself up onto the next small ledge, and collapsed on her back, exhausted and frustrated by it all. She closed her eyes. Riona joined her, but remained standing. Opting not to tell her sister that she’d almost just killed them again, Riona instead gazed around at their surroundings. They had reached the last ledge on the cliff, and could climb no higher. She studied the bulky mass of the cliff wall in front of her. Nothing. Brown earth, slabs of grey stone with bits of glassy shells encrusted in them, dirty sand, and twisting vines were all that she saw. There was nothing. It was just another cliff along the sea, and not the one they sought. Disappointed, but not unsurprised, Riona nestled herself on the ground next to her sister and rested her eyes, too. When she awoke, the sky above Riona had changed. The thick clouds had drifted away, and the sun, bright and hot, now beat down upon her face. Riona stood up, and felt an electric thrill course through her. For like the sky, the wall of the cliff had also changed. Now aglow with the warmth of the sun, the bits of glassy sea shells encrusted into the slab of stone were no longer translucent, but sparkled with a deep, rich, amber light. It was as if each tiny shell, of which there many, were filled with liquid drops of reddish golden honey. There was a pattern to them, too, for seen altogether, they formed a rectangular shape, like a glowing blanket had been draped over the grey stone. The blanket of liquid amber rippled and swayed. There was magic here, thought Riona, who instinctively touched the fabric pouch around her neck, and knew it to be so. She had never felt their mother’s presence more strongly than now. Riona shook her sister awake, and watched as Penn’s drowsy face came alive with wonder at the sight in front of them. Some moments passed, for they were both unsure what to do next. At length, Penn placed a cautious hand onto the rippling blanket, but soon withdrew it, puzzled. Riona tried next, and, though she felt a strange charging current, her hand seemed only to touch a solid wall. But then, as so often happened with Riona and Penn, the same thought quietly came to them at once. Joining their two hands together, they touched the glowing blanket as one. It gently parted for them, like a curtain opening, and Riona and Penn stepped into the dark passageway it revealed. Making their way down what felt like crude earthen steps, Riona inhaled deeply, for there was a sweetness to the air, like that of pleasant herbs and rich soil mixed with the crispness of a fresh ocean breeze. She glanced at Penn, who, she knew, felt it, too, that comforting sense of being home. 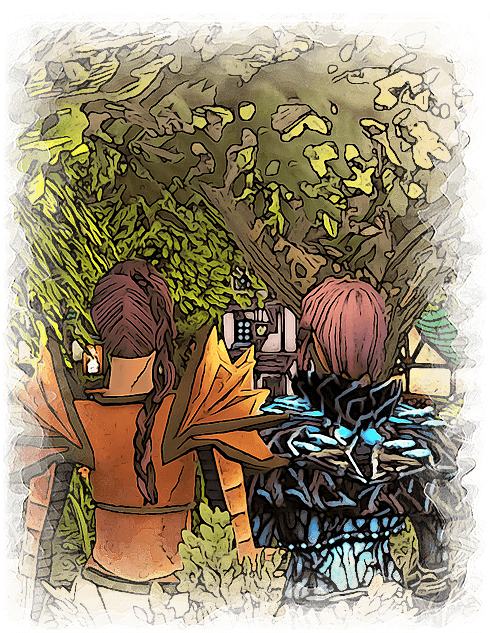 The sensation was strange to Riona, for neither she nor her sister could remember the land they had been born into, and what few smatterings of recollections they did have were only of ash and death, and blackened ruins left by Mallok. Penn saw a soft light glowing up ahead, and for the tiniest of moments, she thought it might be their mother waiting for them. Penn knew such a thing was not possible, but nonetheless found herself eagerly quickening her pace. Though it was not her, the small cavern they now reached, aglow with warm amber light, had been fashioned by their mother, Penn knew this from the placement of the many tiny shells which illuminated the whole of the cave around them, as if their mother had not wanted them to be frightened of the dark. Penn gazed at the strange objects in front of her, knowing, even before she touched them, that just as the blood flowed in her veins, so, too, were these objects a part of her very being. There were two slabs of stone on the ground, one for each of them, upon which the objects, different from each other in color and texture, sat. Penn knew, just as Riona knew, which objects belonged to whom. Penn knelt down in front of her slab of stone, where a gleaming battle axe lay upon a sea of radiant amber, which, Penn saw, was armor meant to be worn. She picked up the axe, and the power which surged into her was at first dizzying, but then not, as if it had just needed a moment to find its course, which it did, and Penn now felt the blood of the earth flowing with her own. Riona, too, had a battle axe, but it was the vibrant blue armor, the color of purest sapphires, which shimmered like the ocean, that she chose first to hold and to clad herself in. Sleek, light, and imbued with powerful magics, it did not just arm Riona’s body, but also her mind, which now churned with sights and sounds, with knowledge and understanding. She saw people from a long ago time, heard their voices and words, their stories and secrets, and felt their traditions, for they were Riona’s now, too. She picked up the axe, her axe, for it seemed to know her heart and mind with such familiarity that it could never have belonged to another. And though her axe felt light in her hands, Riona could feel all of the oceans in the world and all of the rivers in the earth flowing through it. And into her. She turned and looked at her sister, whose gaze met her own. Penn was clad in amber armor, a reddish golden brown which spoke of the earth, of soil and clay and sun. Riona had never seen her sister glow with such radiance before. She saw, too, that Penn’s eyes were no longer cloudy with doubts and frustrations, but were clear and bright with the knowledge they now both possessed. Riona and Penn smiled at one another, satisfied and triumphant, for they at last knew who and what they were. They were Shaman. The brush easily concealed them as they studied the small town below. But Riona had lost sight of him. For the sounds, like music, which bubbled out of the little hamlet, of tinkling hammers and whirling lathes, of pleasant laughter and friendly voices, had melodically drawn her focus away from the young man she now sought. The people were building something, she saw, and idly wondered what it was as she watched the men and women below cheerfully pounding away at timber and laying out sturdy planks of wood together. Riona felt a sharp pang of envy, and hoped her sister hadn’t sensed it, for she was tired of quarreling with Penn. 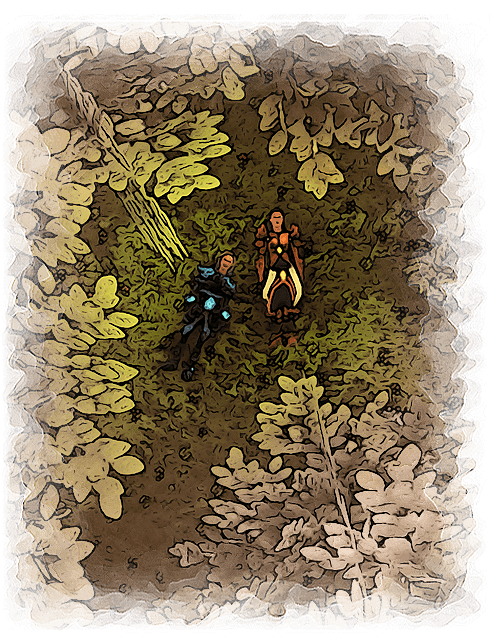 In the two years which had passed since finding their mother’s cave, Riona and Penn, like eager young students who had at last been given access to an education long denied them, had thrown themselves into the pursuit of knowledge, of unlocking the many wondrous secrets which had continuously unfolded for them upon discovering who they were. Shaman. As she thought back fondly now on that time with her sister, Riona knew it had been the happiest one of their lives. For it had been as if the rest of the world, with its loud angry voices, and violence, and the wrathful politics of King Herron, had entirely ceased to exist for them. She and Penn had shut themselves away from it all in secluded grottos or remote mountain hilltops, where they had devoted themselves to the thrilling exploration of the magics they possessed. They had been almost like children, shrieking in delight at every new spell which burst forth from their axes, or yelling with elation at the speed with which their bodies now moved as they swam to unreachable depths in the sea, or performed graceful acrobatics across steep canyon ridges. Each night, they had gone to sleep tired and exhilarated. And each morning, they would awake energized with strange new insights, for their dreams, always of earth and water, seemed to be guiding them on their journey of exploration, gently revealing new secrets to them as they slept. Yes, thought Riona sadly, as she glanced at the sullen expression on her sister’s face next to her, it had been a happy time for them. Things were different now. What had at first seemed to Riona like only a minor disagreement between them, one which she had assumed would naturally resolve itself since she and Penn had always been so unified in mind in spirit, had worsened. And at a speed which frightened Riona. It had begun in recent months, when they’d finally ventured forth from their idyllic seclusion, and were faced once again with a world which hated them. They would never, Riona knew, be able to live openly and peacefully among the people of Ardent. But she saw in her mind, another life they could still forge, a good life. For her dreams now, when she slept, had changed. They showed her the faces of people, of different individuals scattered around the land, just a handful, really, who all seemed lost and uncertain, or out of place in their surroundings. And Riona knew these people were like them. But unlike she and her sister who had been blessed with the gift of sight, these adrift souls still lived in the dark, and did not know that they, too, were the descendants of Shaman. Riona’s sense of purpose was clear. She and her sister needed to find these people, their Shaman kin who shared their blood, and bring them together. She saw it in her mind so perfectly, the beautiful life they could forge. 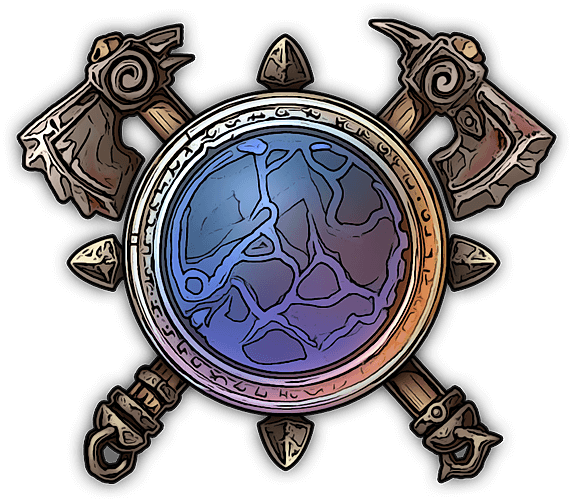 They would find another secluded haven somewhere, as they had before, one tucked away from the reaches of hate, and they would all live together as a clan, a family, like their ancestors had done before them. They would create a peaceful home where the magics of earth and water would quietly thrive and flourish, as would the Shaman people. If only, Riona thought now with rising frustration as she felt Penn shift impatiently at her side, her sister felt the same. Penn felt restless and agitated, not from crouching in the brush for so long, but from the sight of the yellow flag which billowed imperiously atop a wooden pole in the small town below. It was sneering at her, Penn thought, and hated it. The ferocious red boar’s head, snarling and cruel, with its mouth opened wide ready to devour, was the royal emblem of King Herron and seeing it now infuriated Penn. Two years ago, the ground beneath the flag would have promptly exploded, but Penn had mastered control since then. However, it didn’t make her mood any less raw, and the banging and clattering racket now being made by King Herron’s faithful subjects as they merrily pounded away at wood was not improving it any. They were probably building gallows to hang more witches from, Penn darkly mused, then caught sight of her sister’s expression and wanted to scream. With an almost entranced look on her face, Riona was smiling wistfully down at the group of warriors, hunters, wizards, and priests and seemed almost as if she hoped their murderous oppressors would invite her to join them in their carpentry efforts. Penn couldn’t comprehend it. Any of it. It was as if in recent months, her identical twin sister had become an entirely different person. How could Riona look at those people and not see the screaming mob who had murdered their mother, or savagely hunted them for years, or thrown them into a vile prison to rot and die in for the sole crime of being different from them? Penn knew her sister’s argument, that they couldn’t all be guilty, but of course they were, thought Penn. Even if they didn’t have blood on their hands, they were still the breeders of hysteria. They still condoned the persecution, or turned a blind eye to it and did nothing to stop it, and that made them guilty. 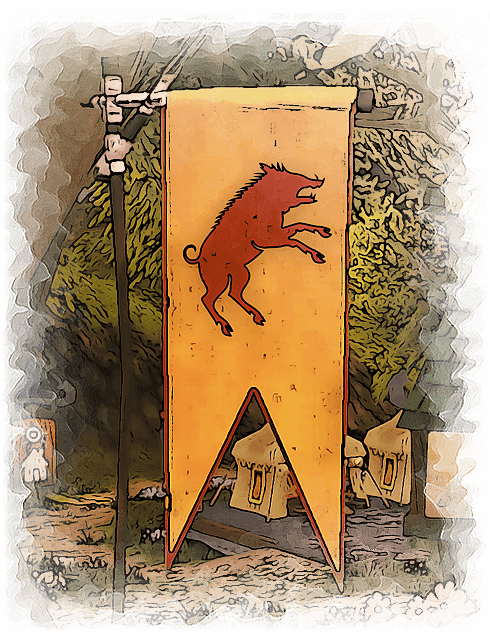 The sneering flag of King Herron, billowing atop their little town, was proof enough of that. But worse still for Penn, was Riona’s vision for their future. They had just spent two years training, vigorously strengthening their minds and bodies so they could at last fight back and stop being prey, and what would Riona have them do? Run away. Her sister wanted them to spend the rest of their lives in hiding, like scared little rabbits, as if the strength and beauty of being Shaman were a shameful secret that ought to be buried deep in some backwoods hole. No, thought Penn, they needed to be seen, boldly, proudly, and with much noise as they struck back at King Herron and his merry band of butchers, The Protectors of the Realm. Again, Penn could hear her sister’s argument that the fearful hysteria in the land would never come to an end if they attacked with violence, for it would only confirm Ardent’s paranoid imaginings of them as being villainous monsters. Her sister wanted to just passively wait out the disease infecting the land, which seemed silly to Penn, for why wait a lifetime doing nothing when it could so easily be stamped out now? For Penn’s dreams had also shown her the faces of other Shaman, like the young man they now sought. But unlike her sister, who wanted to build a family of Shaman and hide from the world, Penn wanted to build an army of Shaman and take back the world. Penn glanced up again at the flag of King Herron. Enough, she thought, and raised her axe to let forth a decimating spell upon the snarling red boar, but Riona roughly seized her arm. They stared challengingly at one another, and in that moment, Penn could see every painful detail of the widening gap which now existed between them, and she hated it. Riona wordlessly pointed. The young man they both had seen in their dreams had now appeared near a well, just on the outskirts of the town. Tall and wiry, with messy yellowish hair covering his eyes, he walked with energy, and seemed more athletic than Penn had remembered from her dream. She nodded to Riona. Moving quietly through the brush, they made their way down the hill. Penn heard the galloping of horses approaching on the other side of the town and paused to look while Riona continued on. White stallions, with riders clad in red and gold appeared. Penn saw the shield of the warrior who rode in first. It displayed the snarling red boar. So did the shields of the hunter, wizard and priest who galloped in after him. They were Protectors of the Realm. Riona’s thoughts were busy trying to work out what she would say to the young man, so it was some moments before she realized Penn was no longer behind her. Riona hesitated, but pressed on since the young man had already noticed her, and seemed intrigued by her axe. He looked to Riona to be only a few years older than she was, and had eyes as blue as her armor, she thought. He smiled, and told her his name was Alain. But before Riona could make a reply, an eruption of loud screams and frightened shouts, an uproar of some kind, exploded from within the town. Riona moved swiftly to see. There were a jumble of visuals and sounds for her mind to untangle all at once, but it was the gruesome sight of the three bodies on the ground which drew Riona’s eyes first. Two women and a man, clad in the distinct garb worn by The Protectors of the Realm, lay dead. They bore no signs of a violent scuffle or a fight, and had on their faces only looks of surprise. Riona knew her sister had done this, and had done it quickly, precisely, and without hesitation. But Riona had not the time for the weight of this knowledge to sink in, for the yelling and commotion had now traveled towards the center of the town. The people were thronged in something of a circle, like spectators around a stage. Riona pushed her way through, and halted. Penn was fighting a warrior, another Protector of the Realm. Except it seemed to Riona that her sister was not so much fighting him as she was playing with him, as if he were a great clunky toy that she would soon grow bored with. Riona watched as Penn, looking as if she had not a care in the world, gracefully dipped and darted around the enraged warrior, easily evading his clumsy sword lunges with an array of impressive acrobatics, which only angered him more, for he would sloppily trip and stumble, unsure where she would next appear. Penn lightly tossed and swirled the axe in her hands. And then she let it all reign down, spells and magic, the likes of which no warrior, hunter, wizard, or priest in the town had ever seen before. Even Riona found herself momentarily entranced by her sister’s dazzling display. 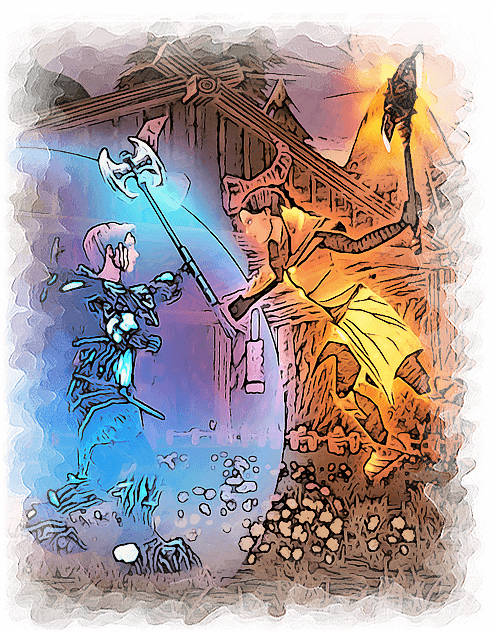 Lights and colors, rich ambers and golden browns, spilled forth from her axe, leaping into the air and cascading down around the warrior, as the soil beneath his feet began to froth and churn, like bubbling water. And soon it swelled, the ground, like an ocean, as great chunks of the earth rose up in waves which crashed down upon the warrior, who now seemed as if a man drowning. But then the ground calmly ceased its violent churning, and released him. He lay upon the dirt, terrified and spluttering, quite helpless, and Riona wanted to watch no more. As Penn briefly studied the crumpled warrior on the ground, it seemed right to her that he should be made to feel the same sense of powerlessness and terror that she herself had been made to feel for so many years of her life. She punished him next with rocks, jagged boulders which spewed forth from her axe and assailed him in a battering stream. She brought forth the wind, too, and it savagely shrieked as it whipped his body to and fro in a frenzied tempest. At length, Penn was satisfied and knew it was time to finish. She split the ground open, and fed him to the earth, which swallowed him completely. Penn gazed around at the townspeople, who now frantically drew their various weapons of magic and howled their fury, reminding Penn of the many screaming mobs from her past. Fireballs and arrows, shadow bolts and lightning strikes, were now launched at Penn, all of which glanced harmlessly off of her, for she had turned her skin to stone and was quite immune to their spells. Upon seeing their efforts were futile, the warriors and hunters, wizards and priests, ceased their attacks and madly scrambled away from her. They turned and ran. Such bravery, thought Penn, and focused her attention instead upon the sneering flag of King Herron. The dirt beneath it exploded, and the wooden pole from which the flag billowed toppled to the ground. As with the warrior, Penn fed the snarling red boar of King Herron to the earth. But they were still hungry, she and the earth, and needed more. So Penn let forth more magics from her axe, and unleashed them upon the town. Houses and statues came thunderously crashing down, as did all of the little shops filled with trinkets and fineries. Penn thought of her years in the Grange, and it seemed fair to her that these guilty people should be stripped of everything they had, and made to live in a barren wasteland, too. So immersed was Penn in the havoc she was wreaking, that the violent blast of force when it hit her took her by surprise. 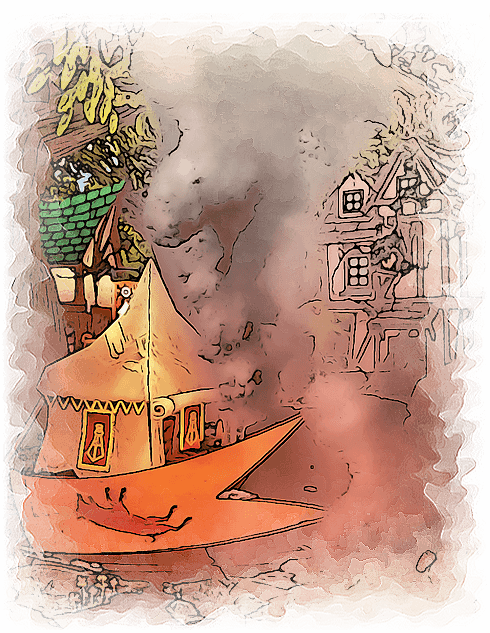 She felt herself being thrown into the air, and was spinning and sailing upwards. Unable to loosen herself from the grips of the force which held her, Penn angrily wondered which spell had penetrated her armor. But it only took a moment for the painful answer to come to her, for it was water which was propelling her through the air. With careful precision, the geyser shot Penn up and away from the town, then dropped her on the muddy ground, where she lay in fury at the extent of her sister’s betrayal. Penn heard Riona say her name, and remembered a time when her sister’s voice had held the power to calmly soothe the raging forces inside of her. But now the sound was brittle to Penn, and it seemed to cut and slash at her, like a sharp blade. She rose and met Riona’s eyes. Riona had thought at first that she would explain to her sister why she had thwarted her. But, though they stood only a few feet apart from each other, Riona sadly saw that the distance between them was much greater than that. It was vast, and could not be reached. She knew Penn was too far away now to hear any words that Riona might speak. And then, perhaps for the last time, as had happened to Riona and Penn all of their lives, the same thought now came to them both at once, and slowly settled itself firmly into their minds. Goodbye. She’d had the dream again, and still could not unravel its meaning. It puzzled Riona. And though the morning sun shone brightly into her cozy shelter, even its gently probing rays were of no help to her in penetrating the dark obscurity of the image in her mind. Feeling reluctant to begin her day until she had solved it, Riona suddenly realized with a start that she was alone in the little hutch, which surprised her for she was always the first to rise. Why had she slept for so long, she wondered, and then felt an odd prickly sensation that something was different about this day. But when she stepped outside, where activity pleasantly hummed all around her as people, young and old, chattering and laughing, went about their morning chores of fetching water from the spring, or chopping up firewood, whatever strange apprehensiveness Riona had felt was immediately replaced with only a gush of contentment. She did this every morning, smiled at the scene around her. Maybe it was foolish, Riona thought, but couldn’t help it. She loved the sight of the many little hutches with their thatched roofs all nestled together in the hidden glade, enjoyed the metallic clanging of a new axe being forged and the excited squeals of pupils as they learned about its powerful magics, and, mostly, Riona cherished the sight of Shaman people living together as a family and blossoming because of it. In the five years which had passed, Riona had achieved her goal. She had sought out the many scattered lost souls seen in her dreams, and had united them together in a safe refuge. She had taught them much, and now they were teaching others. Riona was proud of what she had built. Her only moments of sadness came when she thought of her sister, which she tried not to do, for it had not been easy learning how to live without her twin. She had done it, albeit clumsily and painfully as if she were having to re-learn how to walk, but there were still so many times, like right now, when Riona longed to curl up next to Penn and tell her about the strange dream she’d just had, and together they could unravel its meaning, for Riona knew her sister would have had the same dream, too. The Red Witch, that’s what Ardent now called her much reviled sister. Though hidden away from the world as their little glade might be, tales about Penn still reached Riona’s ears. And they horrified her, not the silly ones about her sister being the bride of Mallok and eating little children, but the other ones about whole towns being razed to the ground if any Protectors of the Realm happened to be passing through them. That her sister, a Shaman who was meant to heal others, was recklessly inflicting pain and suffering upon any who happened to be in her way, like those living peacefully within a town, was not something Riona could abide. Ardent’s terror of the Red Witch, now justified, had only resulted in an even more ferocious climate of hysteria and violence throughout the land. 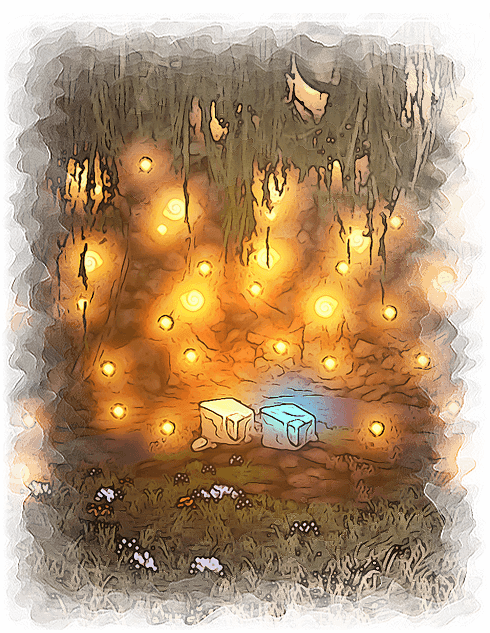 As she pondered this, Riona’s eyes instinctively scanned the little glade in search of its two most recent additions. She spotted them, and felt ever more determined to keep the hate of the world far away from their hidden sanctuary as she made her way towards the small wooden cradle. Riona wondered, as she stood next to Alain and gazed down at their infant twin boys, if perhaps in her children’s lifetime, the world would be different, that it would be free of its intolerance and hatred, and that the Shaman people could take their place alongside the others in the land, and live openly among them as their peers and friends. Riona hoped so. Again, her strange dream came to her mind. Immense black glass, a sea of it, upon which in the middle there sat a thin reddish ring, tiny, but distinct, amidst the surrounding darkness. And then the black glass, if that’s what it was, seemed to slowly ripple and shift, and ever so gradually fill with color. Riona still could make no sense of it. She decided that perhaps later on in the evening, after she had returned to the glade with the needed supplies she had promised the others she would retrieve, that she would contemplate her dream more then. Riona busily gathered her things, and set off. But as she walked out of the glade, she again felt that odd prickly sensation. Riona paused, just for a moment, and looked back at her home, then continued on. It was like water filling up a basin, Penn thought, as she watched the steady stream of reds and golds pour into the valley below her. She’d been sitting perched atop the hill for hours, waiting, but didn’t feel keyed up or restless as she might normally have been, just calm. For what was a few hours after five long years of tirelessly chipping away at a goal which she seemed only ever to be chasing in a circle? Till now, she thought, pleased to finally be able to see her journey’s end laid out in a straight line ahead of her, instead of in a directionless knot. She was alone, and had no army of Shaman surrounding her. But Penn had abandoned that fantasy long ago, when she’d learned early on that she hadn’t the patience for leadership. Trying to teach others had given her about as much pleasure as bashing her head against a rock. Having to repeatedly poke and prod grown adults to grasp what should have been intuitive and obvious had frustrated her, as had having to listen to their squawking and whining, and endless silly questions which did not merit responses. No, thought Penn as she remembered the handful of kin she had sought out from her dreams, they had not been the fierce Shaman she had imagined, nor had she the temperament to mold them into the army she had once envisioned. So she’d gone at it alone. Early on, it had been adrenalizing, for Penn enjoyed prowling the natural terrain, dense forests and muddy gulches, silently hunting her enemy, stalking them unseen, and then, with the blood of the earth pounding in her veins, lethally striking them down, as if from nowhere. But what had been euphoric had soon become dispiriting. For with every band of Protectors of the Realm she slew, another fifty leapt to replace them and hunted Penn right back. And so it went. Back and forth. Back and forth. Except the numbers of her enemy continued to swell, while she did not. It was as if she were merely pecking like a little bird at King Heron’s giant red boar, and, in turn, the great beastly pig only just grew ever fatter. There was a loneliness to the whole unending cycle, too. The lack of progress was demoralizing and gave Penn an empty feeling, as did always being on the move and never staying in one place for long, or having no one at her side to keep watch should she ever inadvertently let her guard slip and drowse off when she shouldn’t. It was during many of those long wakeful nights when Penn would think about her sister. For a long time, her anger at Riona had burned hot, like a fire, and Penn had used it to keep herself warm whenever her spirits were low, her mood cold and bleak. But gradually that fire had burned less and less, till it seemed only to flicker, really, and offered no heat, until at length, more often than not, Penn only just yearned for her sister. Penn gazed down at the valley below her, at the great mass of people all clad in the reds and golds of their king, as they assembled for their celebration. It was the anniversary of the founding of Ardent, and all in the land had gathered together to celebrate their deceased elders, the Legendary Four, who, Penn knew, had defeated Mallok. But Penn’s thoughts were not on the past. For any moment now, there would be a great blaring of trumpets and the drums would begin their steady pounds, and at last, Penn would have in her sights the man responsible for all of the misery and persecution of so many for so long, King Herron himself. Riona moved quietly among the massive throng of people in the valley. She had never wanted to be more wrong about anything in her life than now as she made her way through the swarms of laughing children and families all pleasantly enjoying the festivities. The moment she had overheard the chatter of the passing woodsmen in the forest about the grand event being held, Riona’s fear had been instant. For she knew her sister. She knew that an event in which, not only would every single Protector of the Realm in Ardent be in attendance for, but also the single person her sister despised above all others, the king, be present, that it would be for Penn as if her lifelong pursuit were being served up to her on a platter. All her enemies killed in a single serving. And Riona knew that her sister would be blind to all else, would see only her targeted enemies, and not the children and families and so many countless others, who would all be caught in Penn’s decimating onslaught. Riona heard the blaring of trumpets and the steady tempo of pounding drums. She did not want her sister to be here. Because knowing Penn might be, had just suddenly awoken in Riona a desperately excited longing to see her. The drums pounded. A group of laughing children jostled past Riona. She watched them, silently willing her sister away if she were here. There was an eruption of applause and cheering as King Herron climbed up the steps to his pavilion, and regally seated himself. The ground began to tremble and shake, small cracks and fissures sprang up in the stone statues surrounding his pavillion. The cheering ceased, and instead only the loud groanings of the earth, like a great beast stretching and yawning beneath them, echoed throughout the valley. 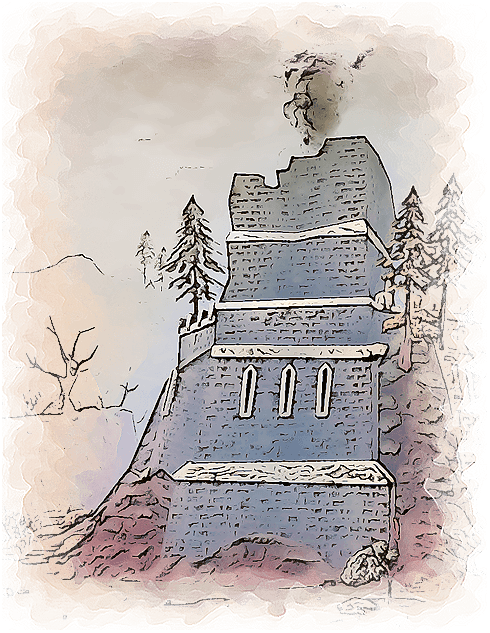 A single fissure, which seemed to start from a hill in the distance began to eat its way through the ground, churning up earth as it angrily snaked its way across the valley towards the pavilion in what now appeared to be a perfectly straight line. Riona watched it, using what few moments were left to forcefully push down the barrage of warm images, tender memories, which had been flooding her thoughts. She drew her axe, and by the time the growling fissure had reached its destination, Riona had steeled her mind, so that when the hot bubbling lava began to explode up from the earth, it was met with an impenetrable wall of water, which she cast around the pavilion. Terrified people screamed and ran at sight of the lava, which furiously lunged up again, a great wave of fiery liquid rocks, only to explode into scalding steam upon colliding with the barrier of water commanded by Riona. It leapt again, the lava, more of it, wave after wave of the burning orange liquid shot forth and attacked the wall of water, only to uselessly burst into vaporous steam each time. At length, the attacks ceased and what remained of the lava hardened into glassy black stone, where it sizzled angrily on the ground all around the pavilion. Riona removed the wall of water and waited, knowing that in a few moments she would see her sister. The valley was now a scene of chaos as people frantically stampeded each other in an effort to flee the ground beneath their feet. But then it was the sky they feared, for suddenly, a speeding bolt of wind, like a missile, shot through them. It tunneled its way through the screaming jumble of people, flinging aside men, women, and children, until it had cleared a path through the crowd, like an ocean being parted. Riona saw her sister then, and felt her, too, for that familiar buzzing current, like that of the energy between two magnets, which Riona had known all of her life, but which had been absent in her for so many years, now crackled once more. Though her sister was still some distance away and had not yet seen her, Riona knew that Penn would have felt it, too, the connection which had ever flowed between them. Riona watched as her sister, swirling her axe in her hands and firing off spells at the lunging Protectors of the Realm as if they were little more than pesky gnats in her way, strode angrily towards the pavilion. 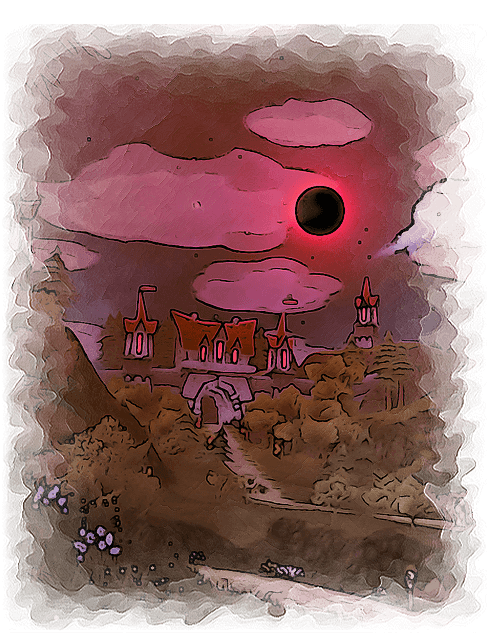 Throughout the valley, there were terrified shouts of, “the Red Witch!” Riona remembered back to a time when such hysterical cries would have been unfounded, and wondered if Ardent knew that they were themselves responsible for having created the vengeful creature who now stormed through them. It flared up in Riona then, a sudden burst of fury at Ardent that she should be made to have to draw her axe against her own sister. And when the flash of rage had passed, Riona stepped out in front of the pavilion, and stood directly in Penn’s path. Their eyes met. Riona was briefly startled to see her own reflection looking back at her after so many years. And as she unwillingly drew her axe, Riona now desperately wished that she could take every single one of those five years without her sister back. Penn did not want to fight her sister. She just wanted Riona to step aside. Just let me have the king! Penn was screaming it in her mind, and had been over and over, ever since she had descended the hill. Unsure of where her emotions began and where they ended, and unable to lay claim to any of them, the result had been something close to a rising inner hysteria for Penn with every step she’d taken from the hill. The impact upon her of having been only moments away from realizing her life’s ambition, of having been so close to at last being able to rid the world of the disease which had rotted the land for so long, the single goal which Penn had devoted her entire being towards and had sacrificed everything else in her life for, to have had that suddenly yanked from within her grasp, not by an enemy, but by the only person in the world she had longed to have at her side to share the moment of triumph with, had been shattering for Penn. Just let me have the king! Penn screamed it again in her mind, and tried to keep the mounting hysteria within her from spilling out as she stared at Riona, who now blocked her path. Though her sister stood in a combative stance, rigid and stubborn, Penn saw in Riona’s eyes something much softer, a quiet, gentle pleading which for the briefest of moments seemed to lessen the raging turmoil inside of Penn. But then she saw him, up in the pavilion. King Herron. And when Penn caught sight of his waxy face and snarling expression, saw the gold crown of power sitting atop his shriveled balding head, and glimpsed the ruthless black eyes which peered out from behind his gang of murderous thugs, Penn’s rage thundered up inside of her once more. The world could start anew, she thought, if King Herron were not in it, for with him would also die his legacy of terror. Penn looked again at his snarling face, that of the red boar, and let all of her fury and need spill forth. With a war-like howl, Penn charged forward. So did Riona. They both leapt in the air, where their two axes clashed together. And so began the battle of earth and water. The valley, which only moments before had been a crazed scene of pandemonium, now grew oddly still as the people of Ardent seemed to have momentarily forgotten their terror and were instead mesmerized by the raw grandeur of the otherworldly spectacle being played out around them as the two sisters fought. 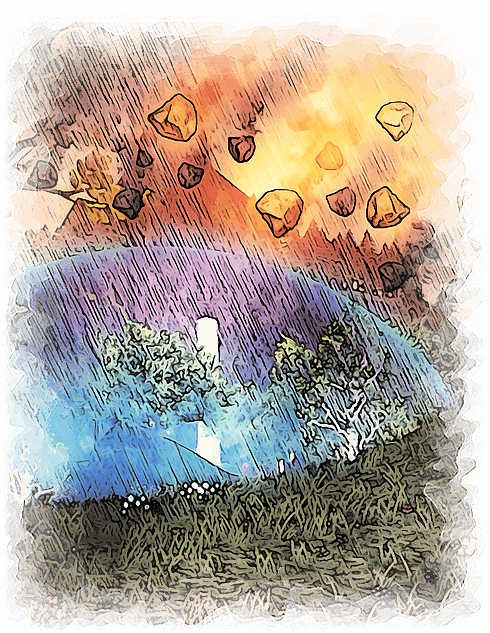 Rocks and boulders rained savagely down from the sky, only to thunderously bounce off the roof of the great dome of water which had risen up all around the valley, a shimmering covered fortress, protecting the people within. And when the furious pelting from the skies ceased, the massive dome of water shot upwards, twisting and turning itself into a single churning tempest where it spun in the sky, ready to meet the onslaught of the shrieking cyclone which now furiously attacked it. And so the winds fought in the sky above the valley, like two animals, fiercely ripping and clawing at each other. Soon the mammoth cyclone, heavy with great chunks of the earth swirling within it, sought to crush the tempest beneath its weight. But the nimble tempest glided in and out of its clutches. The people in the valley gazed up in wonder as next a barrage of piercing arrows, made not of wood, but of water, soared above their heads, hundreds of them, and bitingly attacked the outraged cyclone. But the awe of the spectators quickly turned to fright, for the powerful arrows, having found their marks, slashed and tore at the cyclone, which, like a great bag being ripped open, now spilled its weighty contents onto the valley below. Trees and stones, and massive chunks of earthen debris, violently pummeled the screaming crowd of people. Instantly regretting her error while at the same time eyeing the impending missile of rock Penn had just fired at her head, Riona quickly cast a gentle healing rain upon the valley to dispel the pain so many were in, then immediately conjured up a whip, long and snaking, made of water. Swirling and cracking the whip in the air, Riona forcefully caught and slapped the missile of rock down with it. And as more missiles continued to stream at her, Riona remembered the long ago time, that idyllic time, when she and Penn had spent two years doing nothing but exploring the beauty of their magics together, practicing them, perfecting them. How many countless hours had they spent doing as they were right now, Riona wondered as she snapped the whip, fast and furiously, over and over at her sister’s impending missiles, swatting them all down to the ground like flies. It angered her, their years apart, and a fury arose in Riona, something almost childlike, and she sought now to punish her sister for leaving her. The missiles of rock were soon crushed in the great wave of water which leapt up, then furiously bore down upon her twin, until Penn was submerged entirely. Riona waited, knowing her sister would pop back up again in a moment. She did, and Riona launched a water bolt at Penn. Then another. And another. Every speeding bolt of water Riona unleashed upon her sister, ricocheted off the shield which Penn artfully wielded in her hand. And as she watched her sister gracefully dodging and spinning, dancing, really, amidst the hailstorm of water bolts, Riona was again struck with a powerful sense of familiarity, so that she was ready when the ground in front of her exploded, and it was she who was now made to dance as Penn shot the terrain up all around her with powerful earth bolts of her own. And so it went, back and forth, as the two sisters, sprinting and chasing each other around the valley in a kaleidoscope of frothing dirt and water, reigned spell after spell down upon one another. So consumed was Riona in venting her years’ worth of bottled up grief out upon her twin, that she had become unaware of the toll their battle was taking upon the valley. She saw now the bottomless fissures which had gutted the ground wide open, and heard the anguished cries of people as they fell into the dark bowels of the earth. Riona halted. It was then that she saw the small boy. Alone and terrified, he dangled precariously over one of the cavernous black holes in the ground, his tiny hands desperately trying to cling to chunks of earth which seemed only to crumble in his grasp as he sought to keep himself from falling. Knowing he would plunge to his death at any moment, Riona abandoned all thoughts of her sister, and darted towards the small boy. Finally, thought Penn, glad to have her sister occupied elsewhere so that she could return her attention, which had grown calm and free of its hysterical turmoil, upon King Herron once more. Fighting Riona had been cleansing for Penn. She felt as if she had purged herself of all the hurts and wounds their separation had wrought, and had rid the ever powerful connection between them of its corrosive scars. It was clarity now, which surged through Penn, for it seemed to her that just as the world could start anew with the death of King Herron, so, too, could she start anew with her sister. And this thought was exhilarating to Penn. Penn quickly wove her way through the tumultuous mass of people in the valley, and up to the pavilion. There he was. King Herron. Still cowering behind his bulky wall of thugs, she saw. As Penn launched a hailstorm of rock missiles upon the scrambling Protectors of the Realm whose feet had grown unsteady as the earth now leapt up to devour the crumbling pavilion, Penn knew she wanted only for the king to be left among his entourage, and for Herron to be looking her in the eyes when she killed him. The small boy had slipped even further into the earth’s cavernous jaws. Riona had thought at first that she’d reached him too late, but, peering down into the black depths of the hole, she saw him clinging now to only a root to keep from falling. Needing both of her hands free, Riona quickly set her axe aside on the ground, and, laying on her stomach, leaned her body down as far as she could into the bottomless pit. She caught the boy’s wrist. Murmuring gentle words of encouragement to him till he was reassured enough to let go of the root and firmly clasp her hands, Riona pulled the boy safely up out of the earth. Without hesitation, the terrified boy instantly wrapped his arms around Riona and clung to her with such fierce intensity that Riona forgot everything else around her. For it seemed to her, as she tightly embraced the shaking child in her arms and comforted him, as if she and the boy were the only two people in the world at that moment. It was then, as she held the boy and gently healed him of all his fright so that his tiny body no longer trembled, that Riona suddenly thought of her enigmatic dream again. She saw the endless black glass and the tiny red ring in her mind, and all the colors which came after. Riona smiled, for she understood the dream now. And as she inhaled the scent of the child in her arms, took in his goodness and strength, she briefly closed her eyes to see the shining image from her dream more clearly in her mind. The boy in her arms shouted his protest at their mistake, and angrily fought off the hands which sought to seize him from Riona. He desperately clung to her, and Riona did not release him. She held him. For in the few seconds which Riona knew remained of her life, she wanted to tell the boy the meaning of her dream, wanted to softly murmur it into his ear, a secret for him to have always. But Riona did not have the chance to. The boy was forcefully ripped from her arms, and the spells of many were instantly cast upon her. Riona sought the power of the ocean to shield her from the fireballs and swords, shadow bolts and arrows which unendingly struck her, but found she had not the strength to summon the water. For her own magics were fading as she was. Though her thoughts grew ever more faint and scattered, as if the wind were shuffling pictures in her mind, she tried still to grasp them before they slipped away. She saw her sister from a long ago time, saw her family of Shaman in their little glade, and she saw her infant sons. At the end, it was the image of the black glass and the red ring, and all the colors which came after, that she held in her mind. It gave her a soothing sense of security. Riona’s last flickering thought before she closed her eyes for good, was that she hoped her sister might tell the boy about their dream. Penn studied what remained of the pavilion in front of her, very little, but for chunks of rubble and a single man, who, like a vicious cornered animal, now frantically waved a small dagger around in the air, and growled at Penn. King Herron. There was nothing regal about him, she thought. He was as twisted and unheroic as Penn had always imagined him to be. He cursed her, screamed and called her foul names, yet he still would not meet Penn’s steady gaze, which she patiently waited for him to do. His cowardly eyes darted wildly about and looked everywhere else, but at the person standing in front of him who had endured the vile, hateful world he had created. See me. At last, he did, albeit only for a second, a passing squint, but in that pulse of a moment, Herron’s black eyes met hers, and it was enough for Penn. She hurled a single, speeding, missile of rock at him, and ended the life of the man who had hurt so many. Penn killed the king of Ardent. And it felt good. She inhaled deeply, the sense of completion and of new beginnings. It was finally over. For the first time, in Penn didn’t know how many years, she felt herself smile. It was with eagerness now that she sought her sister, for she and Riona could at last fulfill the words their mother had spoken to them so long ago upon first setting out for Ardent. They would help with the forging of a new and better world. Exhilarated, Penn moved swiftly away from the ruins of the pavilion, and looked for Riona. Her eyes scanned the valley for her sister, but it was the inner compass she had always shared with her twin that Penn now relied upon to direct her movements. Like a magnet casting its current out, Penn awaited her sister’s like response, the familiar latch of the connection which had ever flowed between them. But it did not come. Penn felt instead only an empty space, a void in which the lonely echo of her own forceful current came bouncing back at her, unmet. Penn stumbled. For she knew. She knew even before she saw Riona’s body that her sister was gone, had just felt her twin’s absence from the world so profoundly that it now crippled her movements. Penn caught a glimpse of vivid blue on the ground up ahead of her, amidst the sea of reds and golds, and forced herself to walk. Or maybe she was running. Penn didn’t know. She thought, too, that she might be screaming, but didn’t know that either. The wind, sensing her need to be alone with her sister, howlingly scattered the cluster of reds and golds away from Riona’s body. Or maybe Penn had done that. There was very little now that Penn knew for certain because her mind had crumpled. Penn reached Riona, and sank to the ground, collapsed, for her legs, like her now fragile mind, could not hold the weight of her sister’s death. Penn cradled her twin. She was crying, or was it the earth crying? Both wept. For water now fell from the sky, heavy drops of rain, slowly at first, then faster, till soon the valley was drenched in the wet tears which splashed down from above. It was loud, the falling rain, for which Penn was glad, because she wanted no other sounds but those of water and her sister’s gentle voice, which Penn now tried desperately to hear in her tattered mind. But other invasive noises began to scratch and claw their way in. Howls and shrieks. Ardent. Bemoaning the loss of their depraved king. And now it was rage, bloody and savage, which consumed Penn as she cradled her murdered sister in her arms, and rocked back and forth. Ardent had killed Riona. Her sister had protected Ardent, and they had murdered her for it. Penn’s wrath was as scorching and explosive as the fiery lava which she was now poised to unleash upon all of the valley. She wanted the people of Ardent to be burned alive, every last one of them, and for there to be nothing left of the whole vile realm but dusty ash. Pick up your axe, and do it! Penn screamed the command to herself, but her body was unresponsive and just continued to rock back and forth, stuck in the repeated motion. For it was poisonous guilt now which had spread inside of Penn and seemed to paralyze her, the sickening thought that she was responsible for her sister’s death. Riona had come to the valley to protect Ardent from Penn. And now Riona was dead. She was dead because of Penn. Just pick up your axe, and kill them all! Penn rocked back and forth, faster, more unevenly, as the turbulent battle inside of her between rage and guilt bitterly escalated. The howls and shrieks in the valley drew closer, pressing in on Penn, surrounding her. Noise and motion. Blurred faces, streaked shapes of red and gold. Penn’s vision was as distorted as the frenzied battle being waged within her. She needed something she could actually see, something solid for her shredded mind to latch onto. So Penn gazed down at her sister. And as she studied Riona’s tranquil face and closed eyes, Penn felt the answer to her conflict stirring in some deep part of her. She blindly groped for it within the chaos. It was there somewhere. There. She had found her answer. Penn stood. She had a task to perform, a goal. She turned her skin to protective rock, and embarked upon it. Though Ardent now violently swarmed towards her, wrathful Protectors of the Realm, Penn chose instead to see only the picture of her destination. She instructed the wind to clear a path for her amidst the tangled knot of screaming reds and golds, and it calmly did. Strapping her axe onto her back, as well as Riona’s, Penn heaved her sister up into her arms, and began her journey. Though she had only ever seen it once, years ago, Penn remembered every detail of the place where she was now going. 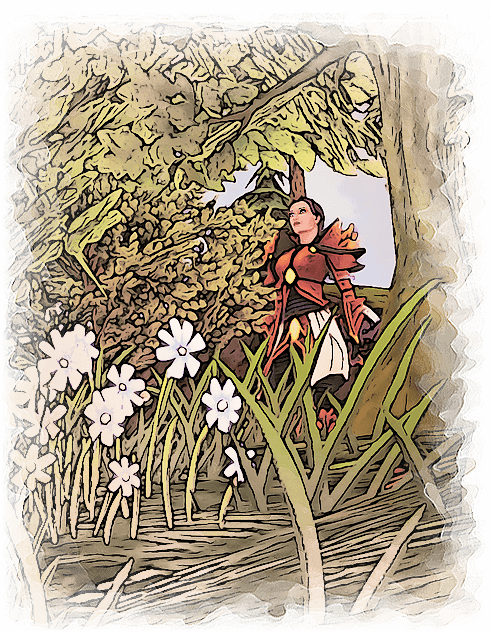 As she marched forward, visualizing its lush greenery and hidden waterfall, the soft mossy earth which had teemed with colorful flowers and aromatic herbs, Penn ignored the hailstorm of bombarding spells which assaulted her, and the jeering faces which spat upon her. She walked on with Riona in her arms, and next pictured in her mind all the little hutches with thatched roofs she had seen, the number of which had surprised Penn, so many. She remembered, too, the picturesque way the hutches had blended in so perfectly with the earth and trees, and the cozy ambience of their grouping. And when Penn felt the first arrow penetrate her crumbling rock armor, she thought of the people who dwelled in all those hutches. Shaman. How magnificent they had seemed to Penn, who, keeping herself hidden, had secretly watched them, mesmerized by the wondrous beauty of Shaman magics thriving without restraint, so rich and plentiful, like a much loved garden wildly blossoming in an otherwise colorless world. 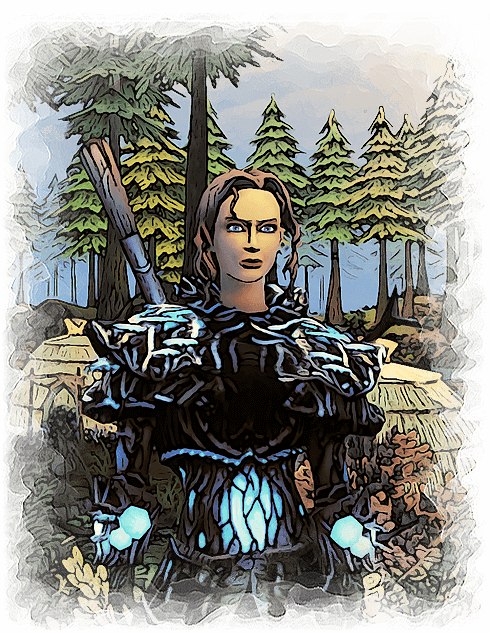 And when the javelin struck Penn, shattering what remained of her tattered armor, Penn remembered when she had seen Riona that day in the little glade, surrounded by her family of Shaman. Her sister, such a natural leader and teacher, had been busily engaged in showing a young girl how to wield her axe, but had suddenly looked up. For Riona had sensed Penn’s unseen presence nearby. But instead of joining her sister in the little glade with their people, Penn had turned away, and stayed on the path she had chosen for herself. Like now, Penn thought as she stumbled, but kept walking forward. She was taking Riona back to her sister’s home in the glade, and Penn was casting aside her vengeance for Ardent. That she would succeed in one, but not the other of these intertwined goals, Penn had known from the start of her journey. Undeterred, she walked on, though her steps grew more halting. At length, Penn fell, and with her, Riona. Ardent cheered. Penn lay on the muddy ground next to her sister, and hoped Riona would forgive her for not being able to return her to her family. But Penn had succeeded in completing her real journey, and knew Riona would be proud of her for that. Though her eyes were weary, Penn gazed around at all the people in the valley whose lives she had spared. That done, Penn was ready now to sleep, as her twin did. But a commotion nearby kept her drowsy eyes from closing. A small boy, shouting and crying, broke free from the clutches of several Protectors of the Realm who sought to restrain him, and was running towards Penn. How strange, she thought as he drew closer, that there was no hatred on his tear streaked face, nor fear of her, as Penn would have expected. What then, she wondered, did the distressed child want? He knelt down next to her on the ground, and Penn understood that it was Riona who the small boy sought. He reached out his hand, then shyly looked at Penn, as if asking her permission first before touching her sister. Though she found she could not move her head to nod, Penn was still able to smile at the boy, which she did, warmly and reassuringly. As she watched him tenderly hold Riona’s hand in his own, his face so solemn and kind, Penn was infinitely grateful to this strange Ardent boy for giving her last few moments in the world a sense of contentment that she had not thought possible. The boy soon released Riona’s hand. Much to her surprise, it was Penn’s hand which he now gently picked up and held in his own. Penn had little strength left, but what few drops remained, she spent now and squeezed the boy’s hand in return. And when she did, a jolt ran through Penn. So many colors she saw in her mind now, and understood their significance. The dream which had perplexed her for some weeks, of an endless blackness but for a tiny red ring, revealed itself to Penn in its entirety. She grasped its meaning, and knew, too, that she needed to share it with the boy. With this boy. But her voice was ragged and weak, as she was. The boy sensed her need, though, could see that Penn had something vital she wanted to tell him, and, so, leaned his small head down close to hers. Penn whispered it into the boy’s ear, the beautiful secret which he alone would be the owner of. The child gazed at Penn for some moments, then nodded solemnly at her. Penn closed her eyes, and was pleased that the last sound she was to hear upon departing the world, was that of the Ardent boy softly murmuring a single word. Shaman. His carriage was almost there. The cheering, rowdy and jubilant, grew louder at his approach, and stirred in him only a sudden desire to flee. He wouldn’t of course, but it was nice to briefly indulge in the alluring fantasy of behaving, not like a dignified gentleman well into his autumn years, but like a willful child running away from his expected obligations. Today was his birthday, and all of Ardent wanted to celebrate it, but King Leo did not. It wasn’t simply that he felt the weariness of his age and the sadness of too many tragedies in his life to want to partake in a day of revelry in his honor, but Leo felt the leaden sense, too, that all of his best deeds, the accomplishments he was most proud of, were long behind him now. But, really, it seemed to Leo most of all that it was just plain wrong to be celebrating a king who was currently failing his realm as miserably as he was. His carriage had arrived. Leo took a final moment to compose himself. How to wave and smile, he wondered, in these dreadful times when secret villains clad in black masks, had risen once more and sought to destroy the kingdom? Why should his people cheer for a sovereign who, instead of swiftly stamping out the enemy in a decisive show of strength and power, was instead floundering and had not the answer to the threat endangering them all? Smoothing his imperial robe and adjusting the crown he felt deserved to be sitting atop a worthier head than his own, King Leo stepped out of the royal carriage. He smiled. And waved. And wondered if he looked as hollow and ghoulish as he felt. Leo hoped not. For what was this all for then, this glittering little charade, if not to make the people of Ardent believe that their king was still as strong and true as ever? He knew the whispered rumors about him of late that a madness had taken him. Perhaps so, Leo thought. But was he mad, or just broken? There was little difference, he decided, between the two. Leo waved and smiled, and felt like a grotesque puppet, bobbing up and down on frayed strings. They just needed to catch a glimpse of him, Leo reminded himself as he began the processional march toward the stairs, and then he could retreat back to the gloomy cocoon of his castle chambers and resume brooding alone in the dark. But even there, he was never truly alone because Leo knew they spied on him. The servants. His sister. She had caught him muttering to himself again, old whispered words, so old and faded with time that Leo wondered if he had only ever imagined them to begin with. But if so, then wouldn’t that have made his whole life a lie? Stop it, Leo commanded himself, trying to keep the worming madness at bay. The sun beat down on his tired eyes. Or maybe it had just been too long since he had been out of doors. The blaring trumpets and pounding drums of the footmen marching in front of him set his teeth on edge, for it reminded Leo of his grandfather, King Herron. A cruel man. Why did this wretched birthday celebration today have to take place here in the valley of all places, Leo wondered as he eyed the stairs leading up to the pavilion and felt his mind slipping again. Into the past, where doubt lurked. As images from long ago, too fantastical to be real, of lava bursting forth from the earth and great domes of shining water rising up, cathedral-like, out of the valley, played across Leo’s frayed mind, he struggled to separate those things he knew to be true from those imagined. His grandfather’s reign of terror, and the sins of Ardent. True. Hadn’t Leo devoted his life to undoing those terrible wrongs from the moment he had taken the throne at so young an age? The boy king, they had called him, though he had been in his teens. His first act had been to officially proclaim his own grandfather a criminal, and to forbid the ongoing seeking of vengeance for King Herron’s regicide. He had overturned all of his grandfather’s sordid laws, cast them out completely, and enacted new ones of his own, better ones. Other acts had followed, so many, in that first decade of Leo’s reign. And were those not his best deeds, Leo wondered as he climbed up the steps to the pavilion, the accomplishments he was most proud of? Hadn’t he thunderously ended the persecution, and put a stop to the intolerance and hatred of others which had infected Ardent for so long? He had. Why then was it sadness, and not pride, which washed over Leo now. As he looked out at all the faces in the valley, the noble warriors and hunters, the virtuous wizards and priests of Ardent, Leo wondered how many of the young men and women out there truly knew about that shameful chapter in their history when so many innocents had been tormented under King Herron. How many of their parents or grandparents had been Protectors of the Realm, or jailers in death camps, or had simply participated in the countless grievous crimes which had been the norm of that day? He doubted that such stories were passed down or told to the young. Despite his having ensured that history remember it all, that the books and scrolls of Ardent scholars faithfully record every gruesome detail of that terrible time, The Persecution, Leo couldn’t help but think as he gazed out now at the youthful cheering spectators that it had all just been hidden away and forgotten, like a dirty little secret. Which made him a failure, he decided. Leo had reached the pavilion. Though the old pavilion had been decimated in another era, he stood now where he imagined his grandfather had stood on that long ago day, the fateful one which had shaped Leo’s whole life. But doubt, having again wriggled its way into his aged mind, was once more nibbling away on the memories it found there, those which had been made by just a small boy, a child at the time. Leo saw in his mind now dreamlike images of a battle between earth and water -- the sky falling, mighty ocean waves leaping up out of nowhere, the ground exploding open, and a black abyss which had sought to drag him down into its darkness. Such abstract images no longer seemed real to Leo, but the feelings they conjured in him did. He remembered his terror, so overwhelming, as he had clung to only a root to keep himself from falling into the chasm below. And he felt again the strong hand, like that of an angel suddenly appearing in the darkness, which had gripped his wrist, and the gentle words she had murmured to him, so calming, as she pulled him up out of the great hole in the earth. She had saved his life, but he had been unable to save hers. He remembered how, as a small boy, she had held him in her arms after pulling him from the abyss. It had seemed to Leo as if he were being wrapped in a wondrous cloak, so rich and warm, and which had stripped him of all of his terrors, gently scrubbed them away with what had felt to Leo like rippling water. So pure and good. Though she had been a stranger to him, and one of the outsiders who he had been taught to fear and hate, Leo had never felt more safe and loved in his life than when the young woman had held him. As he gazed out at the valley now, Leo saw only the wrathful faces of the mob which had ripped him from her arms, and had killed her. Though his mind had been young, Leo had known then that everything he had ever learned up until that day had been wrong. The sun felt brighter than ever on his strained eyes, which he no longer trusted, for they flickered dangerously between the eras now, blurring them, confusing him. His head throbbed. Ardent cheered. For him, or because the other young woman, the sister, had just fallen to the ground? The noise was the same, but the faces were different. Leo blinked, but it didn’t help. His mind was shuffling too fast now between the past and the present. Had Ardent killed Samuel? No, Ardent had killed the twin sisters. He had held the hand of the fallen sister as she lay dying. Hadn’t he? Such a rush of warmth and peace Leo had felt when she had squeezed his hand in return. Or had that been his daughter’s hand, which he’d held so tenderly in his own, just after she had been born? And now Leo felt his unsteady mind crumbling apart, like the earth that day, as grief for his daughter, dark and crushing, rose up and threatened to consume him entirely. His daughter was gone. Taken by villains in black masks. He had not protected her. Just like his wife. And soon all of his people would be dead or enslaved, because Leo would likewise be unable to protect them from the insidious army whose numbers continued to swell in secrecy, and who would be the ruin of them all. Ardent would be destroyed by the Black Thrush. And Leo would not be able to prevent it, for he was just a broken old man now with nothing left but memories and madness, capable only of sitting alone in dark rooms, muttering uselessly to himself. Leo realized suddenly that the cheering in the valley had stopped. An eerie silence pervaded. They know, he thought. His poorly worn disguise must have slipped, and now Ardent was seeing him for what he really was, a helpless shell of a king. Peering out now at the present, Leo saw a valley full of troubled faces. But their eyes were not on him. There was an ominous energy in the air. People shifted nervously, and cast wary glances up and all around them. Dread rose in Leo. Something was happening here. Something awful. He heard a scream, terrified and piercing, echo out from the valley, and then another. More uncertain cries of terror followed. His footmen scrambled around him to protect Leo from what could only be the Black Thrush. Leo saw his sister, usually so composed and strong, now with a look of sheer panic on her face as she moved quickly to his side, and, like so many of the people in the valley, looked up. Leo followed her gaze, and wanted to scream, too. For the Shadow Years were upon them again, when Mallok, with foul magic, had plucked the sun from the sky and had turned day into endless night. Only moments before, the brightness of the midday sun had pounded upon Leo’s eyes, but now the light was gone. Instead there was a murky darkness closing in on them all, enveloping the world with blackness. Leo could no longer see the faces of the crowd in the valley. He could not see his people, could only feel their terror and panic as night swallowed Ardent. Leo gazed up again at the menacing sky. It reminded him of a sea of dark glass, translucent and black, vast and smooth. Endless. And when he squinted hard enough, Leo could just make out the faint remnant of the sun, so small and obscure amidst the unending darkness. 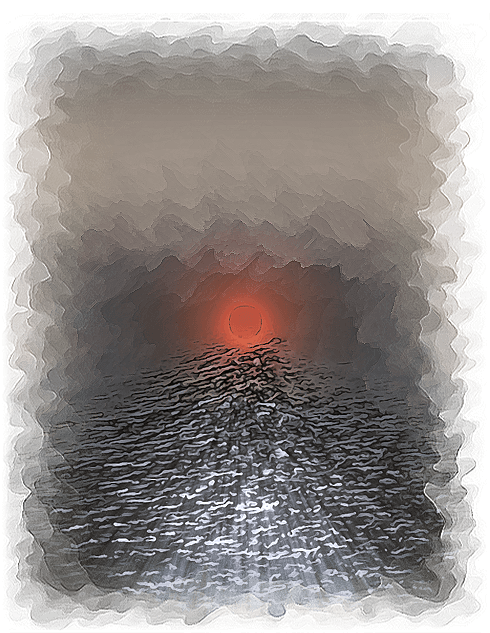 It seemed to sit upon the sea of black glass like a tiny red ring. Leo felt it then, a gentle tug, a pull, of something tucked far away in the back of his mind slowly freeing itself from amidst the clutter, and moving up to the surface where he could see it more clearly. He looked at it. And it seemed to Leo that neither time, nor his own imagination, had ravaged the memory in front of him as he had tormented himself into believing for so long. On instinct, Leo stepped suddenly away from his footmen because he wasn’t feeble and helpless and they were in the way of what he needed to do. He needed to be a king. With a voice which came out strong and true, and which echoed throughout the valley, Leo spoke to his terrified people. His words thundered with conviction because he believed them. And Leo could see Ardent’s faith in what he had told them, felt their terror hesitantly subsiding as he commanded them to not be afraid. Don’t be frightened when it happens. Just wait. Those were but a few of the whispered words she had poured into his ear, when he had been a small boy on that long ago day, and had held her hand at the end. And, so, now Leo waited. He had waited his whole life, had kept the secret with him always. Ardent had trusted him, and was now also waiting, but for what, they did not know. The vast darkness persisted. But Leo knew that foul magic was not at play, nor good magic. This was a phenomenon greater than them all, beyond the control of any. A murmur soon swept across the valley as the first glimmers of light began to trickle in around them. The darkness was fading. Leo gazed up at the sky, and watched the night recede. The sea of black glass was gently rippling above him as the soft rays of the sun, bright and glowing, filtered through unhurried, until soon, the world shone with light once more. The eclipse had passed. Leo looked away from the sky, and out at the valley. It was just as she had said, and it took his breath away. Vibrant color now poured into the valley, brilliant shades of golden ambers and dazzling blues streamed down from the surrounding hills and into the valley. People, so many of them, hidden for so long, their powerful armors shining with the colors of earth and water, had at last come forth. The new colors which surged into the valley seemed to enrich the strength of the existing ones, so that Leo felt as if he were gazing at a dynamic collage as he watched the arrivals take their place alongside the warriors and hunters, wizards and priests of Ardent. Leo no longer doubted the past, nor feared the future. He felt emboldened and blessed. You will forge a new and better world, and in your lifetime, our people will join yours because of it. Her whispered words to him, all those years ago. Though his hair was silver now and his hands were wrinkled, not soft and small as they had been when he had held hers, the secret Leo had kept for so long had finally come to pass, and at a dire time, most needed. 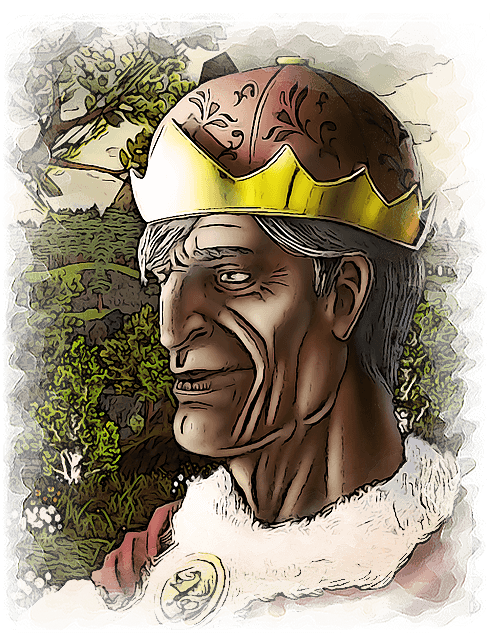 Firmly adjusting the crown on his head as he gazed out at the valley, King Leo smiled. For the Shaman had arrived. Villagers & Heroes is the largest cross-platform MMO ever made, available on iOS, Android and PC.